We arrived at Gostilna Ostrouška (pictured, above; all photos by Christopher Wurst), early yesterday where I met Gašper Čarmen (note: "Gostilna" means restaurant). He is the top wine sommelier in all of Slovenia, and he had recently returned from an international competition in Tokyo. He will be traveling with us for the next couple of days. Also there was Deputy Assistant Secretary of State Bay Fang,who traveled over from Croatia where she was visiting with the diplomatic team stationed there. She, too, will be joining us for the remainder of our trip. 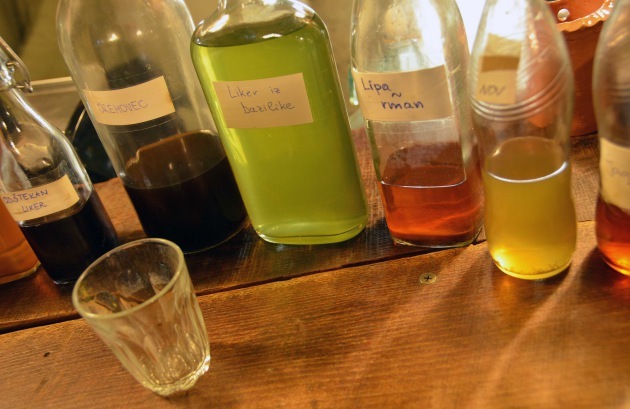 While there, we sampled several eau de vie made from everything from basil to fennel, all from their own gardens, as well as wines also produced there. They also cure there own salumi and prosciutti. We dined on a frittata-like egg dish stuffed with fresh herbs called fritalja. It is flatter and more pancake-like than the Italian version. Next, we traveled to Praprot, crossing into Italy to the Zidarich Winery, where we met with Benjamin Zidirich. 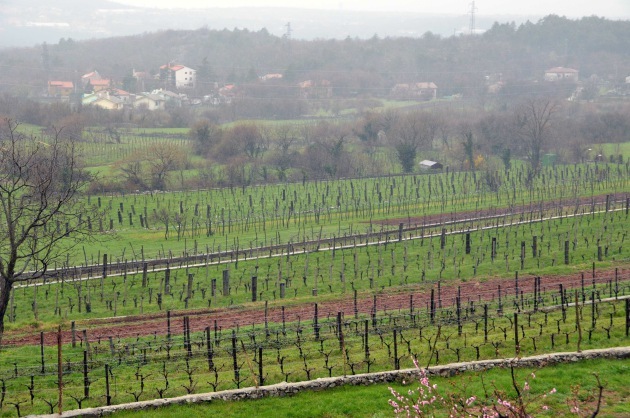 The winery is perched on a hillside overlooking the Adriatic, and it is spectacular. I am afraid that the pictures do not do this locale justice. The wine cave is dug down several hundred meters into the rich iron ore laden terra rosa, and it took 10 years to excavate and construct. 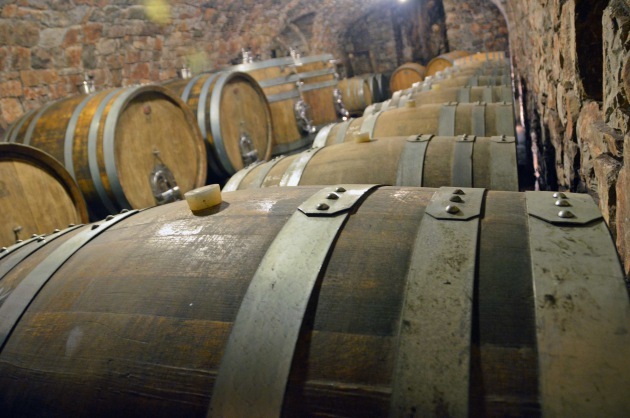 The work was done by stone masons, and it is supported by large stone arches that house giant wooden fermentation tanks and Slovenian oak barriques, as well an incredible large sink that had been hand carved from solid stone. I have seen many wine cellars and caves over the years, but I have never seen anything that compares to that. We tasted several of Ben's wines, including a lively Malvasia, made in the traditional fashion using a form of carbonic maceration, and a remarkably full bodied Refusco. 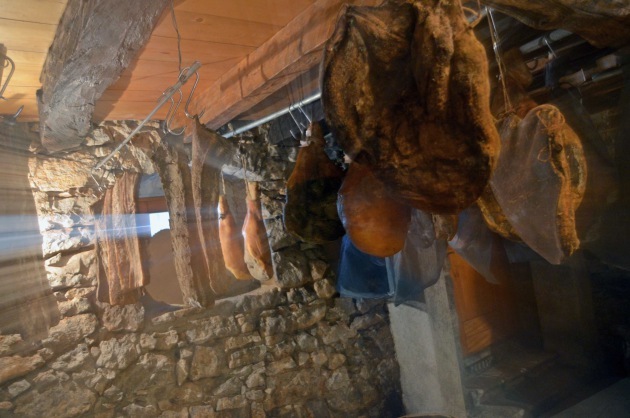 I was then treated to a tour of his curing room where dozens of prosciutti, pancetti and salumi were hanging in various stages of drying, which is done in the traditional way by allowing the northern wind to blow through the room. Suffice it to say, I was green with envy. Later, we enjoyed a lunch comprised of those, with local cheese and some more of Ben's wines. That evening, we returned to Ljubljana (the capitol of Slovenia) where we attended a reception at the ambassador's residence, where I was challenged in a blind tasting of wines and foods from eastern Slovenia, which is the area of the country that chef Cassie Parsons from North Carolina will be covering. Cassie had just arrived in the country, and I was quick to alert her to get as much rest as possible before her adventure begins in earnest. She will be facing very long days, some as long as my day yesterday, which started at 6:30 a.m. and ended at 10 p.m.